This great value manual pull & tear gummed paper tape dispenser has a simple pull and tear action that keeps packing surfaces tidy and allows tape to be dispensed with one hand. This desk top tape dispenser accepts gummed paper tape up to 80mm wide, including the most popular 70mm size used for carton sealing. 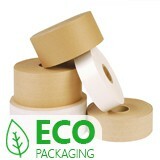 The gummed paper tape sits in the cradle and is simply pulled out to the required length. With a smooth roller action and a serrated cutter, there's no need for scissors or knives. This tape dispenser also features a sponge roller with water reservoir, so there's no messy wetting and it is ready to use. If you're looking to kit out your packing station with a cheap gummed paper tape dispenser, look no further!